In the pantheon of films about cowboys and sheep, it’s a tossup whether “Brokeback Mountain” or “Sweetgrass” is the more beautiful and poignant. The comparison starts and ends with images of noisy animals roving some of the American West’s most spectacular scenery. Drama comes from an entirely different place, but “Sweetgrass” certainly has plenty to say about the lives of isolated men wandering alone with their flock. In an extraordinary series of tableaux that are alternately idyllic and severe, “Sweetgrass” defies the conventions of what most of us regard as a documentary film. With no narration and very little explanation, we’re allowed an intimate look at a remarkable way of life through a shepherding family heading into their final drive. Filmmakers Ilisa Barbash and Lucien Castaing-Taylor spent several seasons as hands-on ethnographer/anthropologists to capture the unsentimental reality of a Montana rancher and his crew as they herd some 3,000 unruly sheep for one last federally approved graze into the breathtaking wilds of the Absaroka-Beartooth mountains. Starting with spring shearing at the ranch, their camera captures the grueling maintenance, feeding, manipulation and herding cycle that has been repeating itself for generations. The purely observational style is established with a disarming shot of a single sheep chewing idly as it stares into oblivion. It abruptly turns stock-still and shifts a laserlike gaze at us. The effect is astonishing in creating a sense of connection with what is otherwise perceived as a solid mass of bleating wool. The camera carries its own gaze with dreamlike detachment, often from within the vast sea of sheep as they are guided up and into the harsh grandeur of a Big Sky paradise. 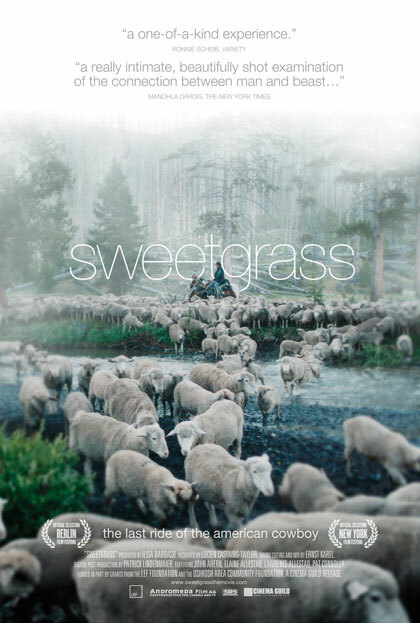 With eloquence and splendor, “Sweetgrass” is a singular record of all there is to love and hate.